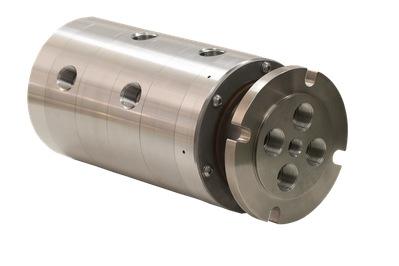 Moog Focal has unveiled its latest Pneumatic and Hydraulic Fluid Rotary Union (FRU). The Model 810 FRU is designed for industrial and marine applications where multiple fluid passes need to be transferred across a rotational interface. There are a number of design options, depending on the application. The standard Model 810 FRU is available with two or four threaded ports of size 1/2 or 3/4 inch. A 1/2 inch on-axis bore enables easy integration with an electrical slip ring, fiber optic rotary joint or both.